Grind spices together in a blender until lightly crushed. Add garlic, orange zest and juice, white wine and the ½ cup olive oil. Blend until well mixed. Pour marinade over chicken breasts and refrigerate 2 to 4 hours. Remove chicken from marinade, reserving marinade, and sprinkle chicken with salt and pepper to taste. Grill until just cooked through, 5 to 6 minutes on each side, basting with reserved marinade. 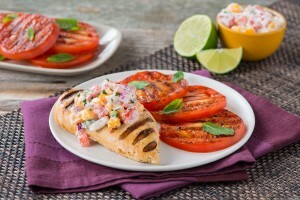 Transfer to a warm platter, place a dollop of Tomato-Mango Yogurt Sauce on each piece of chicken and sprinkle with parsley. Set aside. Place sliced tomatoes on grill, brush with remaining olive oil and grill for about 1 minute on each side. Transfer to the chicken platter, garnish with fresh mint and serve immediately. Serve over Grilled Indian Spiced Chicken.